We are NOT predicting the 2017 UK general election. Unfortunately. They came too soon given their specifics (one must do polling in a number of toss-up constituencies to make sure to deliver an accurate prediction). But we did keep track of what all other polls were saying. What seemed like a Conservative landslide only last month got much tighter over the past several weeks. 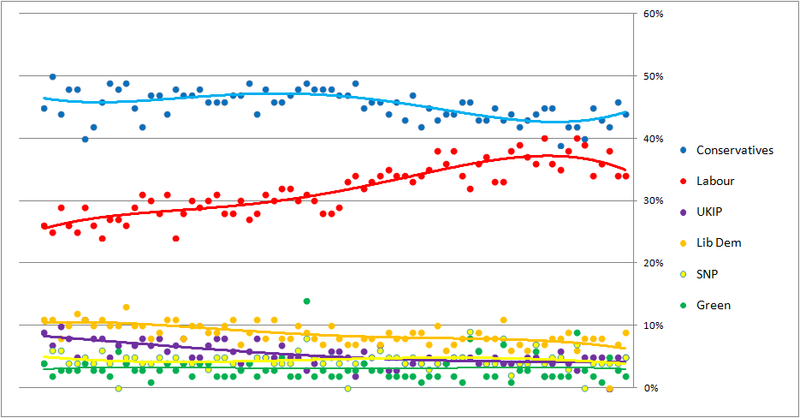 According to the overall polling trends (shown below), Labour started its ascent in May, about the same time the Conservatives started losing ground. In the past week however, the trends started to diverge again, suggesting that the Conservatives might get the majority they thought was so easily attainable back in April. 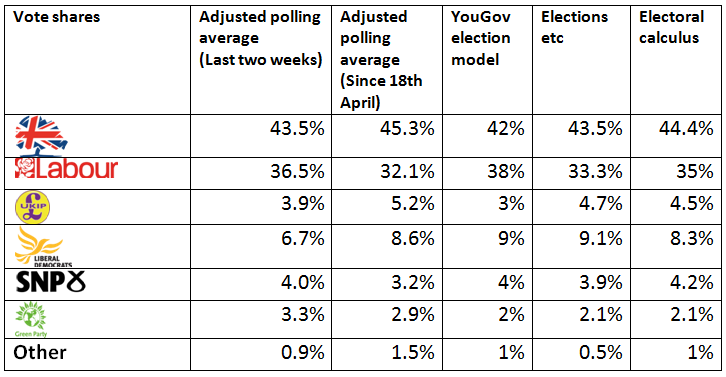 As mentioned in the previous post, we used our ranking of UK pollsters to combine our own adjusted polling average. The idea behind it is rather simple. We create a joint weight of timing (the more recent the poll, the greater the weight), sample size (the greater the sample size, the greater the weight), whether the poll was done online or via telephone, and our ranking for each pollster. This allows us to calculate the final weighted average across all polls in a given time frame. We use this weighted average to adjust each pollster’s numbers in order to get a more accurate estimation of the final result. We take this over the last two week period and over the entire sample (from 18th of April, when the election was called). Bear in mind that this is hardly a prediction. It is just a weighting method based on past performance of pollsters. It need not mean anything in terms of how they will perform at this election. The star performers from before may flop, and the flops may turn out great. Nevertheless, it is still fun to look at what the adjusted polling average is saying. It is giving Conservatives a 9 point lead over Labour. This should translate into an overall majority for them easily. Notice that the difference was 13 points when looking at the entire sample of the past two months. But it is more realistic to look at only the most recent numbers. Comparing this to other forecasting models, Elections etc (compiles an average from betting markets and models) gives the Conservatives a 10 point lead, while Electoral calculus predicts a similar 9 point margin. YouGov is the only one that seems to expect a much more narrow race. Given that they rank no.1 in our rankings this does not seem like such an impossible outcome. On the other hand YouGov did miss both Brexit and the previous general election when they called a tie. We’ll see how it goes for them this time. Interestingly, the Adjusted polling average is diverging from the rest of the group in its prediction for the Lib Dems. It seems to be underestimating them (compared to others) by a 2-3 point margin. Let’s start with the similarities. There is a clear consensus that UKIP won’t get a single seat. This is hardly a surprise. The one-issue party dissolved after its one issue (leaving the EU) got realized. The SNP is very likely to repeat its excellent result from 2015, and will probably end up with around 46 seats. Now the differences. Notice a big difference in seat projections for the Lib Dems. While Lord Ashcroft and Electoral Calculus are giving them only 4 seats, YouGov has them at 12. Britian elects and Elections etc give them 9 seats. They will probably end up somewhere in between the two extremes. What about the main parties? Everyone except YouGov is estimating a clear Conservative majority of between 134 to 150 seats. This would make it an even better result for them than in 2015, and it would give Theresa May a strong mandate. YouGov however, is estimating that the race will be much tighter. They are the only ones swimming against the current and are suggesting a Conservative majority of only 33 seats. This would necessitate a post-election coalition in order to form a government, and it would imply a disaster for May and her decision to call the election. Given that none of these got it right for Brexit, it is difficult to impose any certainty on these predictions. But overall they seem to suggest that the Conservatives will manage to pull off a comfortable victory. Every other outcome will be yet another upset for the pollsters (well, except for YouGov).